When I was born, in 1986, there was already a computer at home (my mum was working at IBM). My sister and I were designing black-and-white birthday posters plenty of wonderful primitive icons and printed on continuous form paper. The aesthetics of bitmap is the aesthetics of my heart, so it was natural to fall in love with Cameron’s World – A love letter to the Internet of old. Its creator, Cameron Askin (28 years old, from New Zealand) is a “full-time designer and part-time artist” based in Berlin. I really wanted to know him, so I found the excuse of an interview. Hi Cameron! I am usually writing about “underground” culture and art. Would you define the content of Cameron’s world as the underground production of the Internet (like you said unrefined, unbranded…)? By the time the U.S. service shut down in October 2009, there were over 38 million GeoCities pages. So GeoCities was reasonably mainstream as far as users on the Internet at that time. Nowadays the aesthetic does seem to be somewhat prevalent in the underground. A lot of websites on the darknet for example seem to look like websites 10 years ago. Not sure why that is exactly. What is still interesting in GeoCities from a web design point of view? What can we learn from the Internet we come from? 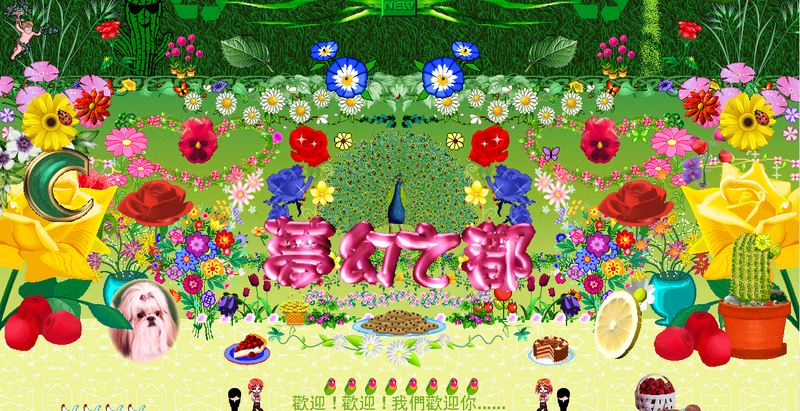 In terms of aesthetics I think every web designer can take something from looking at GeoCities websites. Personally, I’d love to see more illustration on the modern web. 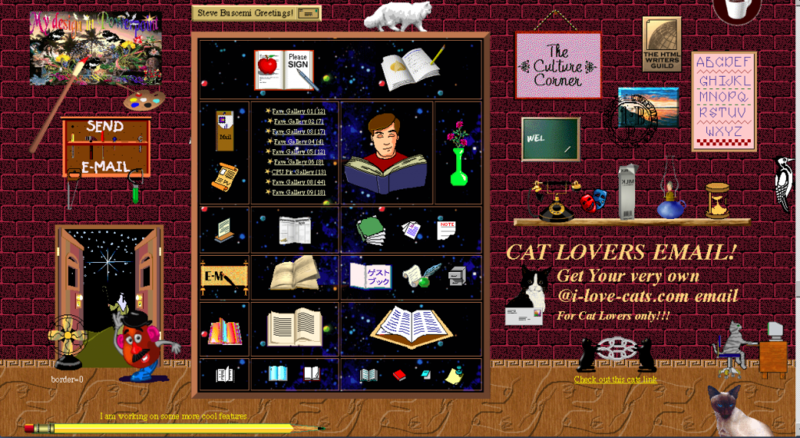 GeoCities was overflowing with clip art and animated GIFs. I think we’re starting to see a shift away from minimal design back to more opulent and expressive aesthetics. Can you try to describe your journey into the neighbourhoods of Geocities? Did you know what you were searching for? Did you have a map in your mind? The initial ‘excavation’ phase of the project when I was gathering resources (GIFs, backgrounds and text) for the website was the part which took the most time. At that early stage I didn’t know what the site was going to look like. It was an intuitive process where I just picked things I thought were interesting, humorous or beautiful. I dropped everything into a Photoshop document and arranged graphics into groups based loosely off themes, styles, colours. I ended up reworking it a few times. Some sections never made the final cut. But overall it ended up coming together quite organically. Your project certainly plays on our nostalgia and love for vintage, kitsch and weird stuff… but I also see an attempt to create a Museum of the Internet (“Geocities Era”). Are you interested in this kind of museology? Yes for sure. I tried to link out to my favourite archived pages. I wanted Cameron’s World to be a bit of a directory for some of the highlights. A previous site of mine, Title Scream (http://www.titlescream.com) is also a bit of a museum. Would you say that Cameron’s world is a form of ‘entertainment’ (gamified experience with cool soundtrack), ‘education’ (history, encyclopedia of the Internet) or an ‘art project’ (collage, love letter)? I actually think it’s all 3 in equal parts. It sits in a weird space. Is this your own ‘love letter’? How relevant is the regard and the choice of the author in this project? In other words: how much of it is impersonal documentation, archaeological collection and how much of it is Cameron’s personal creation? Despite the name of the site I tried to stand back from the project as much as possible. That said, as the ‘author’, I chose all of the content based on what I personally found interesting. And I’ve definitely taken some liberties in the way I’ve organised things in the collage. Just like any GeoCities Author would have. Did you reach any of the GeoCities owners? 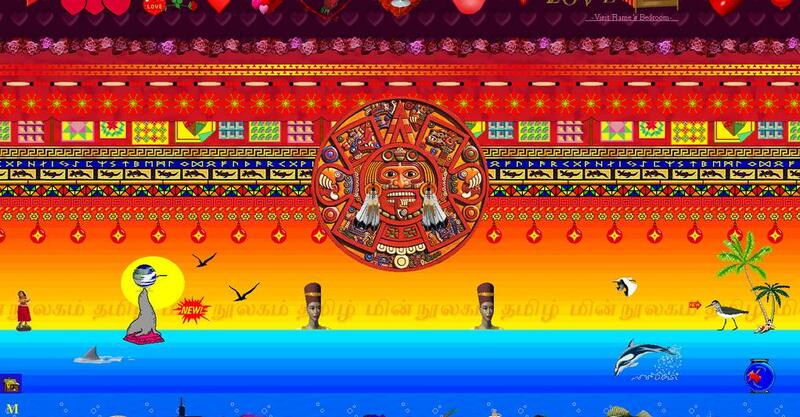 Do you have your favourite geocities page? No didn’t reach out. Too many favourites to choose from! Do you like 20th century art collages? For instance Surrealist collage? In what sense is your collage similar to that and what does it essentially differ? Yes. I guess it’s similar to a Surrealist collage in that it’s full of surprises and unexpected juxtapositions. From a technical point of view the page is ‘responsive’ and doesn’t have a fixed/static layout. Someone viewing it on their phone has a different experience to someone viewing it on a desktop computer monitor. Users can also interact with aspects of the page. And of course the way the user must slowly scroll through the page is important part of the experience.
? The secret lies in the shear number of graphics I collected. I had so much material to work with I was able to group graphics with similar colours and styles together. The biggest challenge was trying to reach a balance between the crazy chaos and something which looked ‘aesthetically pleasing’. Although entirely digital, I would define your work ‘handmade’, because it seems to have been a very manual process. Would you agree? And why? It was in a way manual. Each and every graphic was positioned individually with css. We also created some responsive rules so that the page would look good on any device screen size. Developer Anthony Hughes handled server setup, worked on Node.js asset pipeline and optimisations. We created an overly complicated pipeline that meant layout started in Photoshop, then SASS, then processed in Node with custom Post CSS modules, then went to the browsers where we tweak some more client side. Who is Robin Hughes? Could you tell me more about this collaboration for the soundtrack? He created the music via point and click with a mouse. It’s somewhere between a video game soundtrack and elevator music. All of it’s available for free here. Robin Hughes is a musician based in Berlin. He has a band called The Deep which makes ‘cinematic’ surf music with a touch of psychedelia . Who is your favourite artist? My favourite artists are film makers. David Lynch and Herzog. Book? My favourite book is One Flew Over the Cuckoos Nest. Great characters. Music? I have a pretty broad taste in Music. Since I’ve been living in Berlin I’ve been getting into Techno and the like. Your best place in Berlin? Tempelhof, the abandoned airport turned public park. What do you still bring with you from ‘the lower corner of the globe’? A funny accent and an appreciation for strange animals. If you have any comments, questions, suggestions, or new info, please e-Mail the Webmaster Lieutenant Commander Sarvok Cha’Tavek or me!